The original readers of the legendary pulp magazine Weird Tales could have had little idea of what a landmark release the November ’33 issue would turn out to be. Kicking off the magazine that month, and preceding stories by such already established veterans as Edmond Hamilton, E. Hoffman Price, Clark Ashton Smith and Mary Elizabeth Counselman, was a story with the unusual title “Shambleau,” written by an author who nobody had ever heard of … for the simple reason that “Shambleau” was the very first sale by the 22-year-old writer C.L. Moore. The story turned out to be something of a sensation, featuring a taciturn, smuggler antihero named Northwest Smith and an alien who truly was alien, and written with stunningly evocative language, to boot. Weird Tales readers demanded more, and Moore delivered, placing eight more Northwest stories between November ’33 and October ’36. To this day, “Shambleau” remains one of the most oft-anthologized stories in all of sci-fi, and for good reason. Moody, frightening and strange, it is a story never to be forgotten. 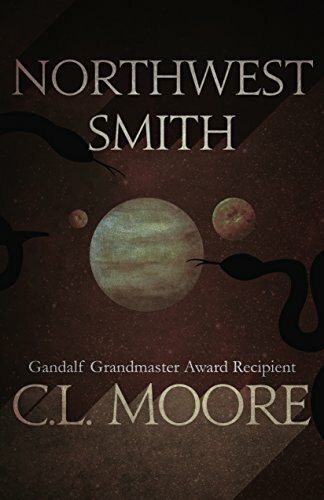 But the other tales of Northwest Smith are all worth reading, as well, combining as they do science fiction, fantasy and horror in equal measures. Smith, in these tales, encounters living gods, creatures that are the basis of ancient mythology, otherdimensional menaces, soul-sucking monstrosities and dreamscape wonderlands, and it was thus no surprise for this reader to learn that the Indianapolis-born Moore, despite her staid job as a bank clerk when she penned “Shambleau,” was later a member of the “Lovecraft Circle;” a group of authors who regularly corresponded with the so-called Sage of Providence himself. Henry Kuttner was another member of this Circle, and he was so taken with Moore’s Northwest Smith stories (as well as those dealing with Moore’s sword-swinging Jirel of Joiry) that he wrote that author fan letters as well, starting in 1936, never realizing that the “C.L.” stood for Catherine Lucille, and that the object of his admiration was a woman! The two would later marry, of course, and inaugurate what was arguably the greatest husband-and-wife writing team in sci-fi/fantasy history. 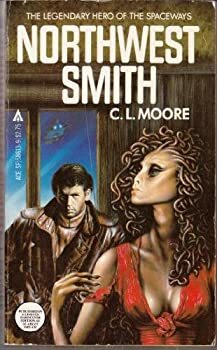 But the Smith stories are essentially C.L.’s own, and remain some of the sturdiest pillars of Golden Age science fiction, now more than 80 years after the fact. (By the way, several folks have suggested that Northwest Smith just might have been an inspiration for George Lucas’ Han Solo character, but I cannot quite buy into that notion; other than the fact that both are smuggler types, they are wholly dissimilar in nature. I can believe, however, that the name “Northwest Smith” might have been an inspiration for the name “Indiana Jones,” although this is only a wild speculation of my own.) And thanks to the 1982 Ace volume entitled Northwest Smith, 10 of these wonderful stories can be had all under one cover. The collection, as might be expected, opens with “Shambleau” itself, in which Smith, while awaiting the fruition of one of his shady dealings on the planet Mars, rescues the titular character just as she is about to be lynched by a mob. He takes the strange young woman back to his hotel room, and were it not for the intervention of his oft-mentioned partner in crime, Yarol the Venusian, probably would never have left that room alive afterward. I will be coy for the sake of those who have yet to read this legendary tale, but will urge them as strongly as I can to at least read it sometime soon, as it really is one of the finest ever given to the sci-fi community. And the second Smith story, “Black Thirst,” is almost as memorable. Here, our hero learns the dreadful secrets of the Venusian Minga house, where women have been bred for centuries to achieve unparalleled heights of almost supernal beauty. Invited into this ancient, sacrosanct pile by a Minga girl named Vaudir, Smith encounters a slime demon from the pits as he discovers the truth about the Minga master, the Alendar. And, in a segment that I recalled vividly from my first reading over 35 years ago, Smith is driven to near madness by the sight of an increasingly gorgeous series of Minga girls; beauty, in this tale, is an almost physical force, capable of overwhelming the gazer. It is a wonderful tale, really, both mysterious and exotic. From here on, this Ace collection presents its stories in nonchronological order; don’t ask me why. In “Tree of Life,” we find Smith hiding out from the authorities in a deserted Martian ruin called Illar. After seeing the ghostly form of a young woman flitting through the area, Smith is trapped with her in some kind of otherdimensional realm, where little people scamper through the undergrowth and a demonic, tree-shaped thing, only referred to as Thag, periodically summons for sacrifice. Dripping with weird-menace atmosphere, this story is a perfect amalgam of the sci-fi/fantasy/horror trio mentioned above. “Scarlet Dream” is another story in which poor Northwest is sucked into an otherdimensional realm through no fault of his own. After purchasing an alien-made shawl in the Martian Lakkmanda Markets, Smith brings it back to his room, gazes at its intricate patterns, and is suddenly kerplopped into one of the most dreamlike fantasylands that any reader has ever encountered. Here, blue, green and violet mists continually drift; bloodsucking grasses caress one’s passing feet; spigots supply the scant populace with blood; and the days pass in a languorous, lotusland dream. Smith spends an indeterminate span of time there with a young woman whose name we never learn, in a story that grows increasingly oneiric as it proceeds. A bravura piece of work from Catherine Lucille here. “Dust of Gods” also transpires on Mars, with Smith and Yarol venturing to that planet’s northernmost ice cap to discover the resting place where resides the actual remains of the Martian god Pharol. Never a pair to turn down a $50,000 commission, the two reach the suspected coordinates, open up a hidden tunnel, and actually do discover the remnants of the millennia-dead godhead. But a moral crisis of sorts looms for the two, in this hugely entertaining and imaginative thrill ride. “Lost Paradise” finds Smith and Yarol back on Earth, having drinks high above the streets of NYC. After assisting a member of the ancient race of Seles — a lost culture in the Himalayas, apparently — when a valuable package of his is stolen, the two are vouchsafed a vision of the beautiful culture that had existed on Earth’s moon millions of years before, and, in an ironic conclusion, learn what happened to turn the titular paradise into a pockmarked wasteland. In “Julhi,” Smith awakens in a pitch-black Venusian dungeon of sorts, in the deserted island ruin of Vonng. From there, he and a very frightened girl named Apri are precipitated into the otherdimensional realm of the title character, a one-eyed, feather-crested woman (?) who plumbs Smith’s psyche and shares her alien experiences with him mentally. In a borderline psychedelic segment, Smith flies through the cosmos with her, sees her people at war, and participates in some kind of street rally, before forcing himself back to where he started. Boasting as it does the collection’s most unusual alien as well as its most wildly imaginative moments, “Julhi” really is another great piece of work from Ms. Moore. “The Cold Gray God” again finds Smith near the Martian pole, this time in snowbound Righa, where Judai of Venus, a famous female entertainer who had mysteriously disappeared many years earlier, hires our hero to steal a “little ivory box” from a local canalman. Ultimately, the secret of this mysterious chest, and of Judai’s strange zombielike behavior, are revealed, in this increasingly frightening tale … one in which Smith is forced to fight for the possession of his own body with yet another of the elder Martian gods. Taking the concept of alien female beauty to the nth degree is “Yvala,” in which Smith and Yarol are hired by a slaving racket to investigate reports of lovely female sirens who have been spotted in the primeval jungles covering one of Jupiter’s moons. After fighting off the slavering alien flora, our valiant pair does indeed discover a mysterious bevy of identical beauties, ruled over by the entity only known as Yvala … a creature so intensely beautiful that she drains the very life essence out of anyone who ventures near. Hard sci-fi takes a sharp turn into the realm of fantasy when Smith seems to discern the drained soul remnants of Yvala’s previous victims; men whose spirits have reverted atavistically to earlier forms! Trust me, this is one wild ride here, brought to life in Moore’s most compelling manner. Published in 1982. From C.L. Moore, the legendary pioneer of classic sci-fi, comes the collected adventures of the iconic space outlaw, Northwest Smith. First published in Weird Tales in the early 1930s, C.L. Moore’s Northwest Smith stories, especially SHAMBLEAU, were hailed as some of the most imaginative and vivid science fiction stories ever to come out of the golden age of sci-fi. At a time when women were heavily underrepresented in the genre, C.L. Moore was among the first to gain critical and popular acclaim, drawing comparisons to contemporaries like H.P. Lovecraft and Fritz Leiber. Northwest Smith, now recognized by many as the archetypal space smuggler and gunslinger, is an adventurer in the classic sense of the word, and these thirteen stories chronicle the bizarre dangers, interstellar wonders, and titillating romances that captured the imagination of a generation. The first time I read “Shambleau” was in an anthology, and I was blown away. I’d enjoy this collection I think. Or now, for that matter.